This may seem super obvious, but earrings are for ears, necklaces for necks, and rings for fingers. 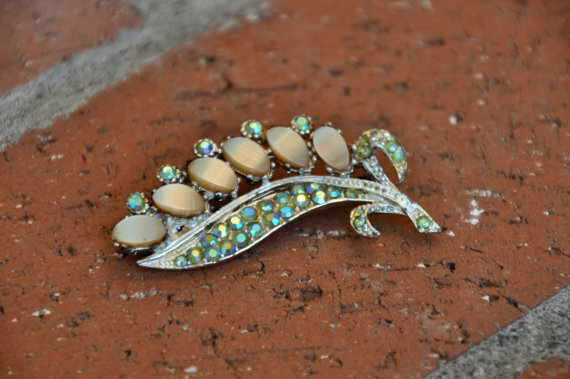 Brooches on the other hand, are creativity's friend. Who is to say where they should go? I'm sure some old ladies, but that is not my point. They can go on scarves, collars, sweater fronts, waistbands, and bags, just to name a few spots. They are the perfect accessory because they can fasten just about anywhere that will hold them. I am always looking for fun ways to accessorize with brooches. I love to get different sized, colorful brooches and mix them on the waist band of a vintage skirt. Karla from Karla's Closet always has beautiful brooches she mixes into her outfits super well.